The Gallery owes its existence to the vision and dedication of Florence Phillips, wife of the mining magnate Sir Lionel Phillips. Her enthusiasm persuaded other wealthy mining magnates to contribute towards a fund for acquisitions by 1909. Among the most famous holdings of the Museum is Rodin´s marble bust of Eve Fairfax. Rodin worked on this bust since 1902. Although the commission fell through, Rodin had this portrait executed in marble. The second version carved by Bourdelle satisfied Rodin and he gave it to Eve Fairfax in 1907; this is the version now owned by the Johannesburg Museum. Two more marble versions and a terracotta model are in the Musée Rodin, as mentioned by the Tate Gallery catalog of 1959; a fourth marble version is listed as part of the collection of the San Francisco Legion of Honor. A bronze version is in the Victoria and Albert Museum, London. M. J. Hare, Rodin's Bust of Eve Fairfax: The Sculptor and his Sitter. Johannesburg: Johannesburg Art Gallery. This 1784 Cape Dutch homestead houses contemporary local art and sculpture including works by Anton van Wouw and Irma Stern, as well as award-winning works from Cape Town Triennial exhibitions. The house was bought by the Stellenbosch-based investment holding Rembrandt Group in 1969. Pierre de Wiessant, reduced draped figure H. 18". Head of Hanako, 1908-11, bronze, H. 11½"
The Gallery celebrated its centenary in 1992. In 1920 Colonel R.H. Whitwell, art connoisseur and philanthropist, presented over 400 works to the Gallery, including British, French and Dutch paintings, objets d'art such as French and Chinese ceramics, early glass vases by Lalique and bronzes by Rodin. 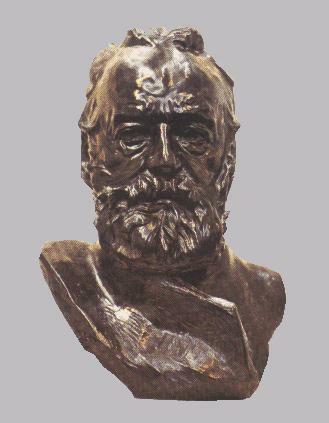 Bust Victor Hugo, 1883, bronze, H. 17¾"